So if your reading this blog post then I'm assuming you are interested in learning more about the Daith piercing and what its actually for, or your just interested in piercings in general. Don't worry there will be no gory pictures of it actually being done or anything, cause otherwise lets face it.....you would be seeing pictures of me with my hands over my eyes and then being sick out the back in the piercing shops little bathroom haha. I wasn't sick because of the pain it was more the sound of the pop as he pushed the needle through that did me....although I will warn you the pain whilst being done is not nice at all! Why I Had It Done? I decided to have this Daith piercing done, as I had heard from quite a few people that it helped to stop migraines....and anyone who knows me well will know I've suffered really bad with migraines since I was about 10. They get so bad that they can last up to 4 days at a time and for 3 of those days I could barely lift my head off the pillow. My sister and brother-in-law paid for me to get this done for my birthday which was on the 20th February, it cost £20 if I wanted it with a plain bar, or £25 if I wanted it done with the heart. 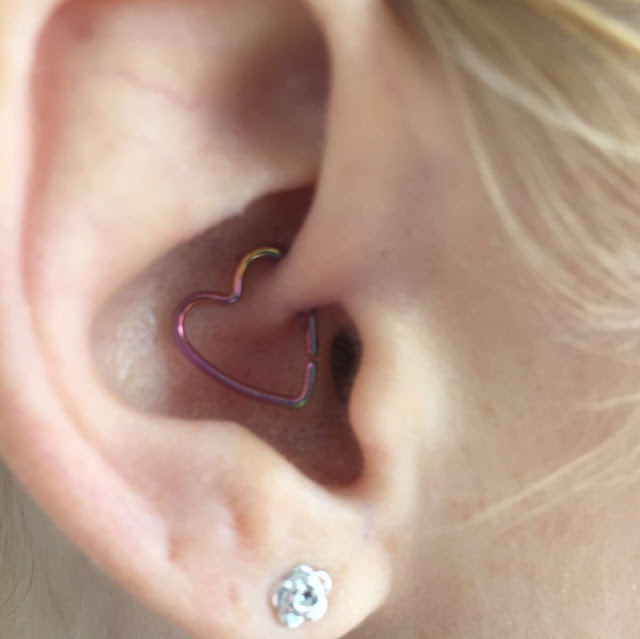 I chose the heart as me personally I think that's what makes this piercing look nice! I personally think this has helped me loads, don't get me wrong I've had the odd headache which has disappeared 10 minutes after taking 2 ibuprofen....and I say this has worked because before there's no way ibuprofen would of even touched me, let alone get rid of my headache completely. Would you ever have this piercing done, if you knew it would help with your headaches?